AirPods Won't Connect To Apple Watch? Here's The Real Fix! You are at:Home»Apple Watch»AirPods Won’t Connect To Apple Watch? Here’s The Real Fix! Your AirPods won’t connect to your Apple Watch and you don’t know why. AirPods are designed to seamlessly connect to Apple devices as soon as you take them out of the charging case, so it can be very frustrating when something goes wrong. In this article, I’ll explain why your AirPods are not connecting to your Apple Watch and show you how to fix the problem! Normally, your AirPods will seamlessly pair to all of the Apple devices linked to your iCloud account. If you just got your AirPods and aren’t sure how to connect them to your iPhone, take a look at my article on pairing your AirPods to your iPhone. Once your AirPods have been paired to your iPhone, you can go to Settings -> Bluetooth on your Apple Watch and see that your AirPods are listed. Once your AirPods show up in Settings -> Bluetooth, open up the charging case and tap on your AirPods in Settings -> Bluetooth on your Apple Watch. 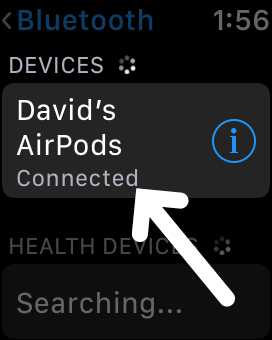 You’ll know your AirPods are connected to your Apple Watch when you see Connected below the name of your Apple Watch. At this point, you can take your AirPods out of the charging case, put them in your ears, and enjoy your favorite songs or audiobooks! If you’ve already set up your AirPods to pair with your iPhone and Apple Watch, but they aren’t connecting right now, follow the step-by-step troubleshooting guide below to fix the problem! Your AirPods may not be connecting to your Apple Watch because of a minor software problem or technical glitch. If this is the case, restarting your Apple Watch may fix the problem. First, turn off your Apple Watch by pressing and holding the Side button until the Power Off slider appears on the display. Swipe the slider from left to right to shut down your Apple Watch. Wait about 15 seconds, then press and hold down the Side button again until you see the Apple logo appear on the screen. Your Apple Watch will turn back on after a few seconds. 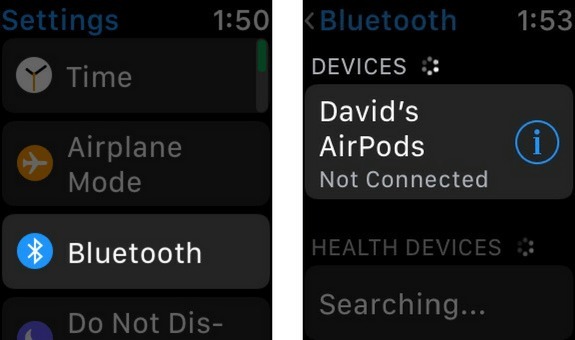 By default, Bluetooth is automatically turned off when Airplane Mode is activated on your Apple Watch. 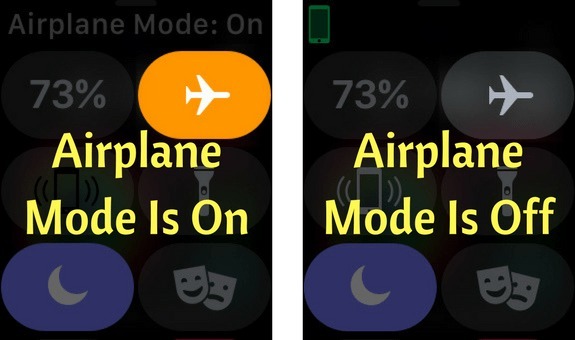 To check if Airplane Mode is turned on, swipe up from the bottom of the watch face and take a look at the Airplane icon. If the Airplane icon is orange, then your Apple Watch is in Airplane Mode. Tap on the icon to turn Airplane Mode off. You’ll know it’s off when the icon is gray. Bluetooth is also disabled on your Apple Watch while Power Reserve is turned on. If you turned on Power Reserve to save up on battery life — that’s okay! 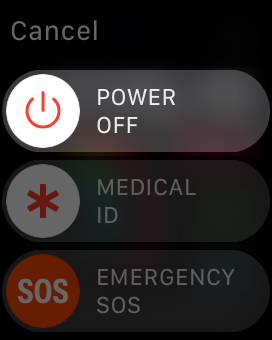 Charge up your Apple Watch, then turn off Power Reserve by pressing and holding the Side button until the display turns off and the Apple logo pops up on the screen. Your Apple Watch won’t be in Power Reserve mode when it turns back on. If your AirPods still won’t connect to your Apple Watch, it may be running an outdated version of watchOS. AirPods are only compatible with Apple Watches running watchOS 3 or newer. 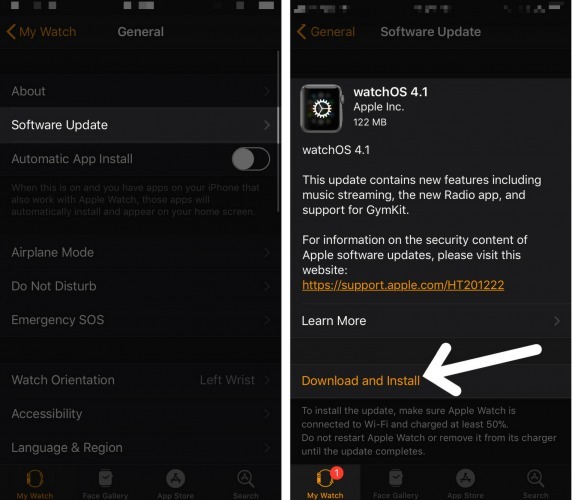 To update your Apple Watch, open up the Watch app on your iPhone and tap General -> Software Update. If a software update is available, tap Download and Install. Note: You can only update watchOS if your Apple Watch is connected to Wi-Fi and has more than 50% battery life. In order to pair your AirPods to your Apple Watch, both devices have to be in range of each other. Both your AirPods and your Apple Watch have an impressive Bluetooth range, but I recommend holding them right next to each other when you attempt to connect them. One of the most common reasons why AirPods won’t connect to an Apple Watch is that the AirPods are out of battery life. It’s not always easy to keep an eye on your AirPods battery life because they don’t have a built-in battery indicator. Fortunately, you can check the battery life of your AirPods directly on your Apple Watch. Swipe up from the bottom of the watch face to open Control Center, then tap on the battery percentage in the upper left-hand corner. 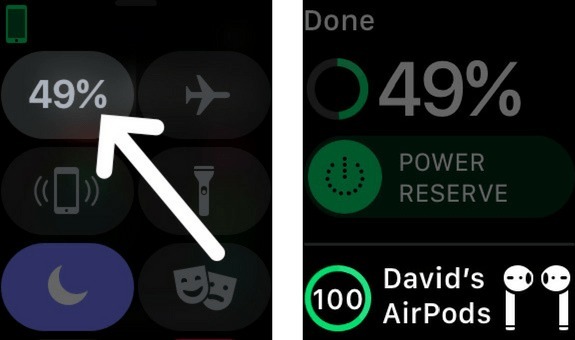 If your AirPods are connected to your Apple Watch, their battery life will appear in this menu. You can also check the battery life of your AirPods using the Batteries widget on your iPhone. To add the batteries to your iPhone, swipe left to right on your iPhone’s Home screen, then scroll down and tap Edit. Next, tap the green plus button to the left of the Batteries. Now when your AirPods are connected to your iPhone, you’ll be able to see how much battery life they have left. If your AirPods are out of battery life, put them in their charging case for a little while. If your AirPods aren’t charging even after you’ve put them in the charging case, then the charging case may be out of battery life. If your AirPods charging case is out of battery life, charge it by connecting it to a power source using a Lightning cable. Pro-tip: You can charge your AirPods in their charging case while the charging case charges. I know that’s a mouthful, but it will really help you streamline the charging process! If you’re having trouble charging your AirPods, take a look at my article on what to do when your AirPods won’t charge. When you connect your Apple Watch to a Bluetooth device for the very first time, your Apple Watch saves data on how to connect to that device. If something changed in the way your AirPods or Apple Watch pair to other Bluetooth devices, then it could be the reason why your AirPods are not connecting to your Apple Watch. To troubleshoot this problem, we’ll forget your AirPods as a Bluetooth device on your Apple Watch. When you reconnect your AirPods again after you’ve forgotten them on your Apple Watch, it’ll be as if you are pairing the devices for the very first time. To forget your AirPods on your Apple Watch, open the Settings app and tap Bluetooth. Next, tap the blue i button to the right of your AirPods. Finally, tap Forget Device to forget your AirPods. When you forget your AirPods on your Apple Watch, they’ll be forgotten on all the devices connected to your iCloud account. You’ll have to reconnect them to your iPhone just like you did when you set them up for the first time. If you don’t remember how to connect your AirPods to your iPhone, scroll back up to the top of this article and follow our guide. If your AirPods still won’t connect to your Apple Watch, there may be a hidden software issue causing the problem. 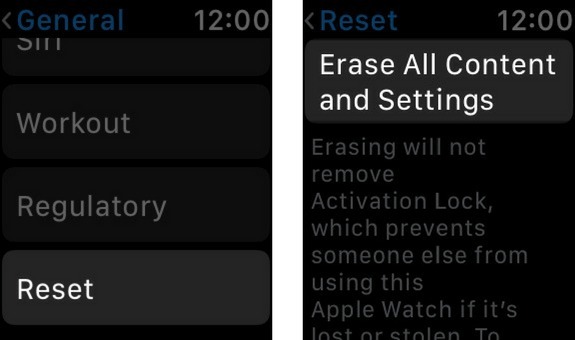 By erasing all of the content and settings on your Apple Watch, we can eliminate that potential problem by completely erasing it from your Apple Watch. I only recommend erasing all content and settings on your Apple Watch after you’ve completed all the steps above. Performing this reset on your Apple Watch will erase all of its content (your apps, music, photos, etc.) and restore all of its settings back to factory defaults. After all the content and settings have been erased, you’ll have to pair your Apple Watch back to your iPhone just like you did when you took it out of the box for the very first time. To erase all content and settings, open the Settings app on your Apple Watch and tap General -> Reset -> Erase All Content and Settings. You’ll be asked to enter your passcode, then tap Erase All when the confirmation alert appears on the display. After you tap Erase All, your Apple Watch will perform the reset and restart shortly after. If you’ve worked through all the troubleshooting steps above, but your AirPods won’t connect to your Apple Watch, there may be a hardware problem. We can’t be certain whether there’s a hardware problem with your Apple Watch or your AirPods, so book an appointment at your local Apple Store and bring both with you. If there is a hardware issue causing the problem, I’m willing to bet it has something to do with the antenna that connects your Apple Watch to Bluetooth devices, especially if you’ve had issues pairing your Apple Watch to Bluetooth devices other than your AirPods. Your AirPods & Apple Watch: Connected At Last! You’ve fixed the problem and successfully paired your AirPods to your Apple Watch. 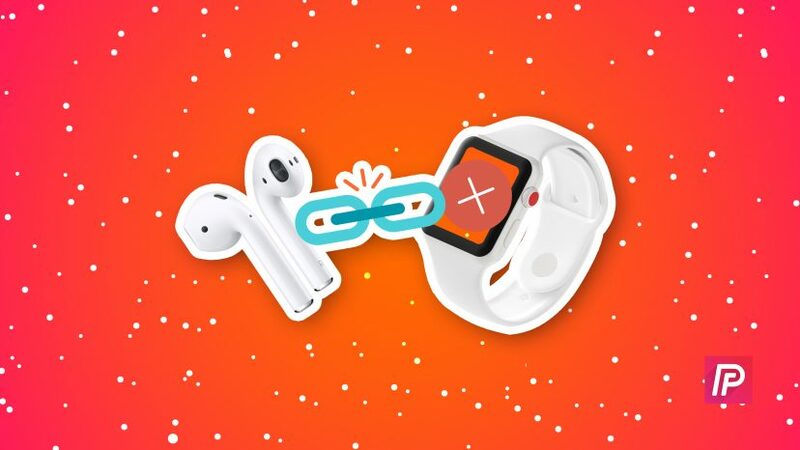 We hope you’ll share this article on social media so you can help out your family and friends when their AirPods are not connecting to their Apple Watch. Thanks for reading, and feel free to leave any other questions about your AirPods or Apple Watch in the comments section below! Previous ArticleWhy Does My Apple Watch Battery Die So Fast? Here’s The Fix! Next Article Can’t Install Apps On iPhone X? Double Click To Install? The Fix!